Districts and charter schools made up less than a quarter of the school days lost to the severe winter of 2016-17, according to Idaho Education News research. Administrators also used longer school days to make up for lost learning hours — and comply with state classroom time requirements. But many were reluctant to extend the school year, for reasons that had little to do with student performance. High school seniors wanted graduation dates left intact. Parents wanted summer break to start as scheduled, in order to accommodate family vacation plans. Teachers had summer plans as well, including coursework or summer jobs. As a result, teachers across the state had to shoehorn lesson plans into a shrinking school year. And according to one superintendent in the heart of Idaho’s snow belt, the truncated calendar contributed to disappointing test scores this spring. Idaho Education News surveyed district superintendents and charter school administrators and asked two questions: How many school days were canceled in 2016-17, and how many were made up? While incomplete, the results are still telling. Respondents said their schools canceled 507 class days, and made up only 125 of them. 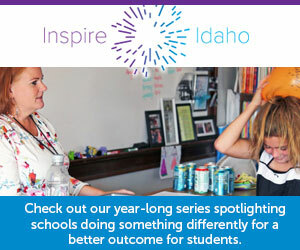 These numbers don’t tell the whole story, several administrators told Idaho Education News. They said the questionnaire didn’t account for extending the school day, the option many administrators used to make up for lost time. And some administrators also said they didn’t need to make up any days at all — since their original schedules far exceeded the state’s classroom time requirements. Sitting on the Oregon border, the Weiser School District also sat squarely in the middle of 2017’s storm track. Before the weather finally cleared, the district needed to deploy cranes to remove 300 tons of snow from school roofs. Snow removal also required hand-to-hand combat. About 115 volunteers — including high school seniors and 70 staffers — climbed onto the roofs, shovels in hand. Superintendent Wil Overgaard calls it the “snowpocalypse,” an experience in the unforeseen. He’s not sure he even had to call 11 snow days in his previous 22 years in the Weiser district. In 2016-17, Weiser lost 11 school days to the winter. From Genesee in north-central Idaho to Buhl and Minidoka County in the Magic Valley, at least six school districts piled up double-digit snow days. While the cranes were moving snow in Weiser, district staffers had to figure out how to move around the school calendar. They reached one conclusion quickly. “We weren’t going to make up day-for-day,” Overgaard said. The district postponed one day of teacher training. Parent-teacher conference day — normally an off day for students — became a school day. For nearly seven weeks after spring break, school was in session continuously, save for Saturdays and Sundays. “It was a grind, but we got through it,” Overgaard said. Weiser lost January “in a blur of blizzard,” Overgaard said this week. By the time the month ended, school had been in session for only nine days. School had been canceled for 10 days. The January whiteout played havoc with schedules across a swath of southern Idaho. Garden City’s Anser Charter School takes its cue from the Boise School District. When Boise called off seven school days — including a string of days after holiday break — Anser followed suit. But that meant Anser’s students spent the better part of four weeks on an unplanned and extended holiday break. Ultimately, Anser called off nine school days. Anser added back one day, in mid-January — mostly to help students readjust. “Getting back into the routine was very hard for young students,” said Heather Dennis, Anser’s organization director. Administrators had to cobble together a revamped school schedule — not knowing when the storms would actually subside. Nampa School District administrators met during the January snow days to talk through their options. In Nampa, as in many districts, the makeup schedule meant different things in different grades. The district converted four half days into full days, in all grades. High school seniors received a graduation present of sorts — two additional full makeup days. That’s all because of a multilayered, and lenient, state law. For parents and kids, bad weather equates to a snow day. A day when working parents may need to find a last-minute sitter. A day when students get an unexpected or unwanted day of downtime. School administrators think instead of classroom hours — and the guidelines set in state law. The numbers vary. The law requires 450 instruction hours for part-time kindergarten students; 810 hours for first- through third-grade students; 900 hours for fourth- through eighth-graders; and 990 hours for ninth- through 12th-grade students. It’s impossible to say exactly how Idaho stacks up nationally. Some states base instruction requirements on school days, not classroom hours. But according to a 2014 Education Commission of the States report, Idaho’s requirements are relatively lax. Thirty-six states base their requirements on classroom hours. Only nine states require fewer kindergarten hours than Idaho does. Only four states have more lenient requirements for 12th-graders. When the weather turns bad, the law gives schools some leeway. Schools can apply for a waiver and write off 11 instruction hours due to “adverse weather conditions and facility failures.” Seven school districts sought waivers in 2016-17, State Department of Education spokesman Jeff Church said. Some administrators applied early, because they didn’t know what the rest of the winter would hold. In several cases, however, the waivers were something of a moot point, since the schools still exceeded classroom instruction requirements. During the winter of 2017, the Legislature gave districts another option. They passed a brand-new law allowing storm-ravaged districts to seek a separate waiver — and provide fewer instruction hours than the law requires. The law hinges on county disaster declarations. Based on that yardstick, there were no shortage of eligible districts, since 25 of Idaho’s 44 counties received winter disaster designations in 2017. However, no district applied for the new waiver, spokesman Blake Youde said this week. Timing was a factor, Overgaard said. Weiser wanted to draw up a new calendar as soon as possible, and it didn’t want to wait on the Legislature. The new waiver law passed easily, but it also passed late in the session. And it didn’t go into effect until April 6, when Gov. Butch Otter signed it into law. Many districts and charter schools were able to meet state instructional requirements, with little or no makeup time added to the calendar. But that doesn’t change a simple fact. Across much of Idaho, teachers had less time with their students, and students had less time with their teachers. The unexpected time crunch affected the learning process — because teachers had to scale back their lesson plans and focus on core topics. How will this affect student performance? It depends who you ask. In Nampa, MacTavish says it’s too early to tell. Scores on the spring Idaho Reading Indicator seem stable. A new literacy initiative — targeting extra state dollars to help at-risk readers — might have offset the effects of school closures. In Weiser, Overgaard has seen only partial results from the ISAT, the state’s online test in math and English language arts. From what he has seen, he says the disrupted school schedule took its toll. “We’re not overly excited about our statewide assessment scores,” he said. Extending the school year wouldn’t have done much to help Weiser’s ISAT scores. Instead, it would have added more class time after the testing period. And Weiser officials decided to bring an abnormal academic year to a normal conclusion. The Class of 2017 graduated on May 21, as originally planned. School closed for the year on May 25, as originally planned. Patrons seemed to appreciate closing the year before the Memorial Day weekend. In Nampa, the school year will end Friday — on schedule, albeit with a half day that grew into a full day. The idea of extending the year prompted “significant pushback,” MacTavish said. The teachers’ union opposed the idea — saying some of its members had signed up for summer classes or lined up summer jobs. Parents didn’t want to have to change June vacation plans. Not surprisingly, the first Friday of June remained a drop-dead date. “It was pretty clear that this was the route that our community wanted to take,” MacTavish said.